I’ve been talking about veganism a lot less lately because I’m frankly embarrassed to be associated with many of the prominent vegans in the “animal whites movement.” We have foodie vegans singing the praises of expensive juice cleanses, nondairy cheeses, and gourmet vegan restaurants. We have activists like Gary Yourofsky and the Non-Humans First movement saying that oppressed humans can speak for themselves, and nonhumans have it worst than anyone else on the planet, so all efforts need to focus on them, and no tactics are off-limits. And we have white vegans co-opting the BlackLivesMatter hashtag to focus attention on nonhuman animals, and calling black people racist and/or speciesist when we complain about this. Blacks and other people of color don’t have the privilege to ignore racism, whether inside or outside of the animal rights movement. I can’t blame black people for caring more about the bodies of their loved ones being violated and killed by police and terrorists than the bodies of nonhuman animals being violated and killed by farmers and slaughterhouse workers. And given the mainstream media’s slant on the events highlighted in Terry’s quote above, it is laughable to say that we have a voice, while nonhuman animals do not. We have the ability to speak, but our voices are ignored and silenced. I linked to the sites of some other activists who get it in my blog entry on activism with DxE. [Edit, June 2018: I left DxE in September 2015.] One I want to highlight today is Dr. Amie “Breeze” Harper of Sistah Vegan Project. I read her Sistah Vegan anthology several years ago, before my transition to male. I was excited to see an entire book of essays by black female vegans. I also felt a kinship to Dr. Harper as a practitioner of Buddhism; while I don’t currently identify with Buddhism as a religion, the Buddhist concept of ahimsa, or nonviolence, is central to my ethics (which is why I chose Ahimsa as my middle name). Her blog is filled with excellent, thought-provoking essays on racism, sexism, food justice, and many other issues, in addition to (and in conjunction with) veganism. Dr. Harper organized an online conference, “The Vegan Praxis of Black Lives Matter“, which I attended earlier this year. It was an excellent, interactive series of talks, covering racism, sexism, cissexism, and many other issues that are usually ignored by the mainstream vegan and animal rights movements. Recordings of the conference are available for purchase, and a book will be forthcoming. I’ve contributed to the Sistah Vegan Project’s fundraising campaign on GoFundMe, which has been running for over two years now and has raised just over $10,000 to date. In contrast, when the popular high-end vegan restaurant, Millennium, announced that they had to leave their San Francisco location and started a Kickstarter campaign to fund their move to Oakland, they raised over $100,000 in less than a month. This is, to put it bluntly, fucked up. …in a popular queer group a white trans man posted his fundraiser for top surgery and raised roughly half his funds within a day. He also garnered a lot of support from members of the group. A trans woman of color posted her fundraiser for living expenses because she was fired from her job due to discrimination and she was asked to promptly remove the post because it violated “community policy”. After reading the above, I gave money to the Free CeCe documentary campaign, to elevate the voices of black trans women. Even with the backing and promotion of Laverne Cox and Janet Mock, that project is not yet fully funded. If animal liberation is to succeed, the movement must address the concerns of oppressed humans as well as nonhumans. The BlackLivesMatter movement must not be co-opted or ignored by white vegans. Black voices, vegan or non-vegan, need to be heard. Utter nonsense, this article just reads as follows “I’m a victim look look I’m a victim too” When you are writing from your own position of privilege. Where is the outrage in the “Black” American community when other races are murdered? Where is the outrage towards the millions of humans enslaved in the Far East? Where is the outrage towards the billions of other species being tortured daily? Hop off your soapbox and acknowledge your own damn 1st world privilege. I’m not a victim, I’m a survivor. And I acknowledge my privilege as a US-American living in a comfortable San Francisco apartment. I use that privilege to help elevate the voices of others less fortunate than myself. Not sure why you are putting “Black” in quotes, but black folks in America are tired of being told that “all lives matter” whenever we speak out against white supremacy. I’m not going to demand that every time a black person posts about another black person being murdered that they also post about someone of another race or species being murdered. You sound like you’re trying to justify not supporting the black community because that would involve effort. Instead of checking your own privilege, you’re telling someone else to check theirs, even when discussing issues that they personally experience. Pipe down and listen up. Brilliant reply. Hold these whiny, professional victims accountable. If they were happy, they woudn’t be doing stunts like this to get attention. They need prozac, not praxis. Aaaaaaaaand of course, your first commenter COMPLETELY proves your point. I watched this video with gratefully, an open mind and feel more educated by what she said. I really will keep the points of her video in mind when I go about my animal rights activities. My ONE concern was when she said she feels her life is of more value than that of a rat or puppy. I do not feel my life is of more value than a rat’s or a puppy’s because I see them as different, but EQUAL. This is the fundamental belief in true veganism I believe -that our lives (whatever ethnicity we are) are not more valuable than animals. It follows of course that I do not believe white people are more valuable than visible.minorities. However, I admit I am just at the beginning of being educated about human oppression and my privilege as a white person. I very much value this video for helping me learn about this. I just don’t think specisim should be validated by in vegan belief systems, whatever ethnicity you are. I don’t think being oppressed as a human makes it okay to say your life is of more value that a rat’s or a puppy’s. Again, I acknowledge my privilege and ignorance about human oppression, but I am TRYING to learn 🙂 That one line in the video about her life being more valuable in her eyes than a rat’s or puppy’s just seemed to contradict her message of how we need to open our eyes to human oppression too, as vegans. I believe that all animals, including humans of all ethnicities loves are of equal value. My favorite mantra/quote: All suffering in the world boils down to some lives being considered of more value than others. I personally feel that all sentient beings are of equal value morally. But I also recognize that as humans we can’t help but be somewhat speciesist when it comes to valuing our own lives over those of nonhuman animals. A person’s actions are more important to me than their philosophy. If a person is vegan and is also speaking out against all oppression, human and nonhuman, that’s what’s most likely to create positive change in the world. The girl in that video is a blatant speciesist. That is as equally disgusting as a racist. Your movement isn’t going to gain any traction even with white Vegans that are sympathetic to your plight. For instance, I love all of my non-white friends, but if they say something like in that video, they get no support from me. I don’t accept that garbage from my white friends either. Keep spreading stuff like that and you’ll fast lose any support you may have had a chance at. Even my black VEGAN Facebook friends think that your line of thinking is b.s. You can’t ask for consideration that you’re not willing to give. And while I despise racism a much as anyone, the solution to discrimination in general isn’t that we should allow oppressed people to claim a halo while they’re actively oppressing others, and non-human animals are others. If black lives matter activists want me to take up their cause they MUST be Vegan and MUST be in the fight for animal liberation. Anything less is hypocrisy and I won’t endorse it. What does it say about someone who understands oppression vividly and CHOOSES to oppress others? And you VEGANS in the BLM movement have a responsibility to point out the b.s. and hypocrisy of a non-vegan poc asking for equality they they’re not willing to give. Until people of all races extend the same consideration to non-humans that they themselves expect, I’m not fighting for them. The fight for equality starts with Veganism. Being a CRA and a non-Vegan is hypocrisy at its finest. People who understand oppression are obligated to refrain from using it themselves, I think any sane person would agree. A non-Vegan poc is essentially a Nazi to animals. How many of you would have been fighting for Nazi human rights when the Russians invaded and were ravaging both the country and the people? The atrocities committed by the Red Army were equally as disgusting as anything we’ve ever seen, how much sympathy do you feel for Nazis who were killed? I’m approving this one comment from you only Derk, so others can see your ugly attitude (which I’ve already seen more than enough of on Facebook). Calling anyone a Nazi, vegan or not, is not going to get any sympathy for your cause. Do not post here again; any further comments from you will not be approved. Do any of them think? All they do is feel. They feel this. They feel that. Well, I fell they are all in need of psychological help. The animals that are not human do not have time for their petty, self absorbed, diversionary tactics. Disgusting narcissists they are. Shalinda, I approved your comments this time, but ableism and victim blaming are not welcome here. Any further posts of that nature from you will not be approved. I’ve watched this video more than once and will continue to watch it along with recommending it every chance I get. It’s excellent!! With regard to the comment by Rachel Richards that she sees her life as more valuable than that of a chicken or a puppy, I fully understand the comment. Veganism is not a demand that animals, including humans, be equal across the board; rather, the demand is for equity. Equity means equal opportunity, and veganism calls for all living beings to have an equal opportunity to pursue life as their true selves without being oppressed or exploited. So, I do value my life more than that of other animals–we are not equals, but we all deserve an equal opportunity to be ourselves in full expression of whatever species we might be. For anyone to compare the treatment of other animals to human slavery is dehumanizing in several ways. It comes across as an attempt to silence victims of slavery, both past and present, and to devalue their experiences. To suggest that veganism must be put before concerns about human liberation or that veganism will lead to human liberation is an example of reductionism. It’s also a sign of white privilege to ask PoC to set aside their pain and suffering in order to work for the liberation of other animals. First, veganism is not a cure-all for racism, sexism, ageism, classism or ableism. All of the oppressions have to be addressed at once, and that involves listening to members of marginalized groups so that we can begin to learn about the complex forms of exploitation they’re experiencing. Put another way, it’s not a question of working for either humans or other animals (either/or reasoning is a logical fallacy anyway); instead, it’s a matter of working to end ALL oppression. For anyone claiming it’s speciesist to talk about how dehumanizing it is to compare human slavery with what humans do to other animals, please know that speciesism refers to elevating humans over other animals, to making humans the center of concern at the expense of other animals. Well, guess what? It’s not elevating humans or speciesist to recognize their pain. It is, however, dismissive and disrespectful to accuse PoC of being speciesists–it’s a form of oppression to make that charge!! 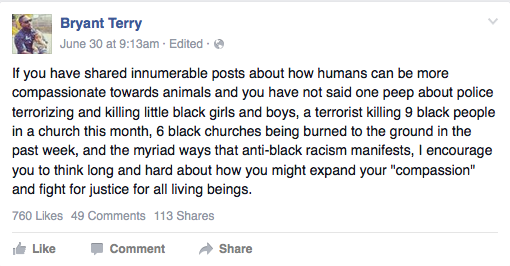 Why do white vegans keep trying to silence or be oppressive toward Blacks with these claims of speciesism? When will privileged whites learn that they can’t fight oppression against any animal by being oppressive toward other animals, especially toward PoC? I’d say some whites have some hard questions to answer. Hi, I have a question about the topic of comparing African slavery to animal welfare/rights as being dehumanizing as Rachel mentions. It seems many intersectional and pro-intersectional vegan activists have made this comparison in some way before, yet in a way that was not offensive as was Vegan Cheetah’s. To me as a matter or pure logic (if we could isolate it from current reality and historical context), it makes perfect sense to me. In my mind, an anti-speciesism stance would state that violence/exploitation against non-human animals and human animals are equally wrong. Is the problem (in the Vegan Cheetah video), that it is a white person using the issue of violence against black people to make his point and minimizing the issue of violence against black people? And/or the sort of selective “guilt trip” tone that these videos take, as they are typically geared towards either feminists or black activists? I’m sure I have seen or read black activists discussing the same issue but with totally different effect. I’m wondering if this comparison should be considered wrong across the board, or rather wrong only in the context of the comparison itself being used as an “all lives matter” style tool to exploit/minimize. Thanks for your time in reading this and for all of your wonderful writing. Btw is funcrunch files on facebook? I’ve only seen your blog posts when I see them shared on VFN. I saw funcrunch photo but not files. Thanks for the comment! I consider enslavement to be an accurate description of how we treat farmed animals (Christopher-Sebastian McJetters has a good essay on the subject). But I no longer think it’s appropriate for non-black people to make that comparison directly, especially in the context of “All Lives Matter”. There are ways to compare like systems of oppression without appropriating the struggles of oppressed human groups, as explained in another of Christopher-Sebastian’s essays. I don’t have a separate Facebook page for my blog yet, but you can follow my personal page, where I link to these blog entries. Thanks again! Several comments. First, the vegans who are enthralled with high-end juices and gourmet restaurants are not really ethical (e.i., real) vegans. They are in it for weight loss, health, looks, etc., and not for the concept of ahimsa (nonviolence to all beings). The veganism outlined by Donald Watson who founded the Vegan Society in England in 1944 it was meant to be ethical system, not just a dietary choice. Second, I believe most vegans are against prejudice and discrimination but are fighting primarily for animals. That does not mean they are racists or do not care about human beings. It means that they have limited time, energy, and resources and have been involved primarily with animals because the animals, in fact, have NO voice. The human justice movement has many more organizations and many more resources than animal-related groups. Animals from factory farms, researach labs, and circuses cannot march in protest, cannot call legislators, cannot boycott companies and products, cannot vote. Also, how many social justice advocates are also fighting for animals? This should not be a one-way street. Third, some who accuse vegans of racism or misanthropy are often themselves guilty of speciesism. They maintain they human beings are invariably more important than all other creatures, sometimes declaring that animals’ only value is what benefit they are to human beings. That is speciesism. Some condemn the comparison of animal exploitation and abuse to slavery (the same patriarchal “ownership,” exploitation, and abuse of human beings that is still occurring with animals). Refusing to acknowledge the horror of such treatment of animals is speciesism. Some condemn the use of the word “holocaust” when applied to the billions of animals who are abused and killed for human pleasure and profit because they claim “Holocaust” only applies to the crimes of Nazi Germany. Discounting the suffering and deaths of billions of animals as unimportant is speciesism. By the way, the word “holocaust” originally meant the killing of animals as a sacrifice. Vegans do not constitute a large population. But I would guess that a greater percentage of vegans are against racism. sexism, and against the discrimination of the LGBT community than the percentage of those communities are against animal exploitation. We are also working on other issues such as wage inequality and, most certainly, the environment. Finally, I think it is unfortunate that when people are trying to help make the world better by fighting injustice, whether the wrongs against human beings or against animals, they spend so time criticizing each other for not doing enough. Most of us are doing what we can. – I no longer engage in debate about who merits the title of “real vegan.” I fear the battle for reclaiming the original idea of that word as opposition to all exploitation of animals, and not just referring to a plant-based diet, has been lost. This is why I now speak more of animal liberation than of veganism. – I too have limited energy, and do not expect everyone to spend equal amounts of time fighting for all oppression. But that does not excuse animal rights activists appropriating the oppression of other groups, using “All Lives Matter”, for example. And oppressed humans absolutely need and deserve attention whether or not they are vegan. Saying “we won’t care about your struggles until or unless you care about animals” is just petty. – Non-black and non-Jewish people should not use the terms “slavery” and “Holocaust,” however appropriate they might seem to describe the exploitation of animals. These words are too often used by people who have no understanding of the horrors of black slavery or the Nazi regime. Absolutely the horrors of animal exploitation should not be discounted, but that does not excuse appropriation. Christopher-Sebastian McJetters has some good tips on how to compare like forms of oppression without appropriation. – Finally, pattrice of VINE Sanctuary posted on the issue of BlackLivesMatter recently. Well worth a read. People don’t want to give to individuals here, especially not individuals of color, because it forces us to truly realize how broken and racist this capitalist system is. We can’t possibly believe that people would need living expenses help in a fundraiser or healthcare expenses that aren’t related to having a more socially acceptable trans body TM (which is a healthcare issue in and of itself and something trans people deserve access to but it somehow more important in the minds of queer and trans folks than disabilities and the poverty they can cause)… I am rambling and taking up too much space here. White folks, vegan white folks, have brought me to tears with the racism I’ve seen and of course have participated in as a student of white supremacist culture. Unlearning it daily has been rewarding and I try to share that liberation with other white folks- it’s not all saddening hard work- it affects all of us. It’s time our movements became intersectional across the board, not just in places with the most marginalization. Really looking forward to the book volume as well. Thank you. an update on my preorgss!I will say that I have quasi-succeeded at my sub-goal for July. First, I feel success because:1. In a literal sense, you could say I succeeded. I “selected all the footage” for the video, yes: I collected 13 minutes of clips that I’d like to use, plus some still images—more than I even need.2. In the sense that veganism is a process our effort is what counts, I feel success. I’ve been working more diligently on this project than any other activism in the past, and I feel very excited about the quality results so far.But! I feel it’s only partial success because:1. Along with “selecting all the footage,” I was, less explicitly, planning to have the clips arranged in order, paired up with lines from the script, ready to be edited together. But I’m only part-way through this task.2. I haven’t collected all the still images and graphics that I’d like to use in the video’s sections on veganism. For those sections, I plan to make bulleted lists and possibly other graphics that I still need to create/obtain. This was another less explicit goal I had for July, and it is not yet completed either.So I don’t know exactly what to call this, but I am still very excited about the project, and I will continue full-force! * * *Lastly I want to note a few things about the way I’ve been approaching this project:- Stating the goal publicly has been a powerful motivation. It helps get me past laziness or other barriers and just sit down to work on a task. After I sit down and get started, usually the laziness is replaced with excitement about the project, and I’m able to get a lot done.- Dividing the goal (“create activism video”) into smaller projects (“write script”) and breaking those projects into smaller tasks (“write rough outline”) has been enormously helpful. To have a clear list of 15- to 45-minute tasks has made real preorgss achievable. If I can just sit down and do the task, then I make concrete preorgss.- I’m less confident about how I’ve set specific deadlines for each project. First, it’s hard to estimate in advance how long each project will take, so I may end up rushing certain parts. Second, it adds stress a sort of “must” ( therefore a sort of hierarchy; I’ll write a blog post about this soon). So the deadlines have made it harder to experience veganism as a joyful, flowing experience. This recurring stress has, of course, made it harder for me to remain peaceful and calm in the face of daily frustrations. I consider my everyday peacefulness to be related if not integral to my veganism, so this is a concern for me. (The problem might just be that my deadlines this summer have been too ambitious..? )I’ll report on my preorgss again around the end of August!toward a vegan world!stevenote: i posted this update on july 24 because i’m leaving for a trip on the 25th and won’t be back until august. How much are the new movements tied to money/capitalism? People’s medicine (emotional, economic, social, health, food) is about freedom, sharing and open source, not about buy, Buy, BUY (to do it properly). Be creative, not consumers.